She's been turning heads thanks to her virtually unrecognizable makeover for her portrayal of flame-haired Queen Elizabeth I in Mary Queen Of Scots. But Margot Robbie was back to her usual glamour as she put in a stylish appearance at the Toronto International Film Festival at Bisha Hotel & Residences on Friday. 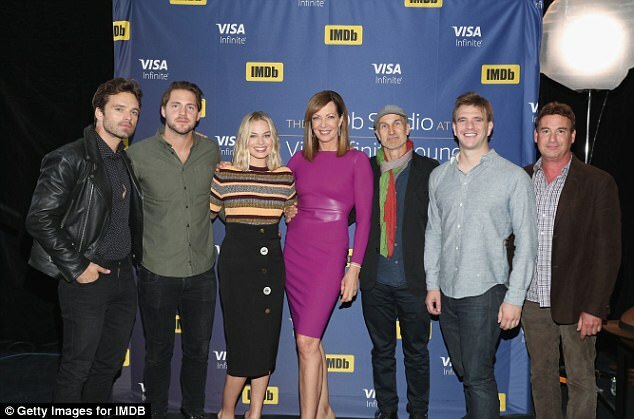 The Australian actress, 27, looked stylish in stripes as she sat on the IMDB Studio Hosted By The Visa Infinite Lounge panel ahead of the premiere of her new movie, I, Tonya, later that night. The Wolf Of Wall Street starlet looked incredible in a chic ensemble of a black pencil skirt, featuring large button detailing. Margot, who's playing Olympic figure skater Tonya Harding in the biopic, teamed the number with a striped half-sleeved sweater. The former soap star ditched the red wig she has been sporting on the set of Mary Queen Of Scots in England in recent weeks and was back to blonde. Margot looked radiant, wearing her short golden locks in loose waves, and accentuating her stunning features with natural make-up. 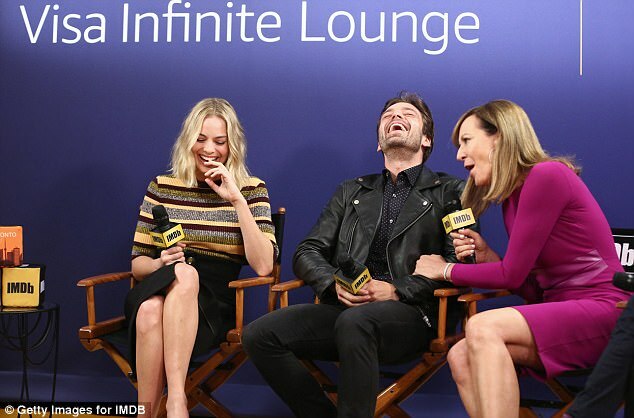 She shared a laugh during the panel with Sebastian Stan and Allison Janney, both of whom are her co-stars in the upcoming feature film. Allison, 57, was the picture of elegance in a bright purple cocktail dress, and Sebastian, 35, had flung a black leather jacket over a black and white shirt. The acting trio posed for a photo alongside their director Craig Gillespie, who was film festival chic in a multicolored scarf, rumpled blazer and cloud grey cap. At one point, Sebastian, Margot, Allison and Craig all stood for the cameras with three of the movie's producers - Tom Ackerley, Bryan Unkeless and Steven Rogers. Margot is also one of the producers of I, Tonya. Another producer wearing multiple hats is Steven, who wrote the screenplay. Twice an Olympian and famed for her triple axel, Tonya found herself slapped with a lifetime ban from the U.S. Figure Skating Association in 1994. Her bodyguard and her ex-husband had enlisted a thug to break her skating rival Nancy Kerrigan's leg, and though he bungled the job, he still bruised Nancy severely enough to force her out of the U.S. Figure Skating Championship. The next month, both Tonya and Nancy competed in the Winter Olympics in Lillehammer. The former earned eighth place, the latter a silver medal. Though the three men - as well as the getaway car driver - served time for their involvement in the attack, Tonya pleaded guilty to conspiracy to hinder their prosecution, thereby managing to keep herself out of prison. Sebastian plays Tonya's ex-husband Jeff Gillooly, Allison Tonya's mother LaVona Fay Golden. Margot was in Britain earlier this week filming yet another biopic, this one of Mary, Queen Of Scots. 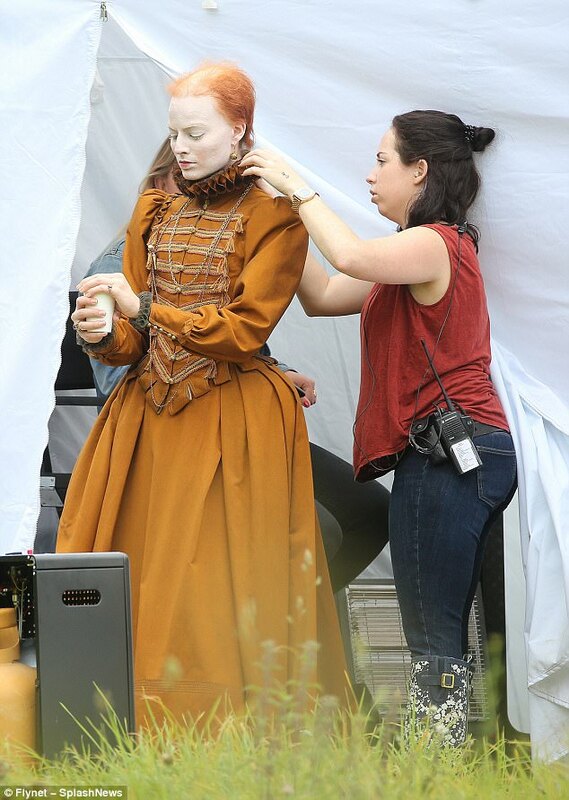 Photographs emerged of Margot on set on Tuesday, unrecognizable while playing Queen Elizabeth I, who'd had Mary, Queen Of Scots beheaded in 1587 for conspiring to assassinate her. Her face powdered white and an extravagant orange wig on her head, Margot was the spitting image of the 'Virgin Queen,' down to the ruff around her neck. The film will apparently also offer a glimpse of Elizabeth with a bald spot she'd typically kept hidden beneath her hairpiece.